Notes: This has to be the penultimate achievement in the ramen producing world. First off, these noodles are great; they are flat and curly with an unsurpassed, fine character. The package comes with a myriad of flavorings, including sweet soy, bumbu sauce, seasoned oil, chili powder, and finally, an extra special packet. After boiling the noodles and mixing with the seasonings in a bowl, you add 1/2 a cup of boiling water to this packet and stir – it’s a soup base. 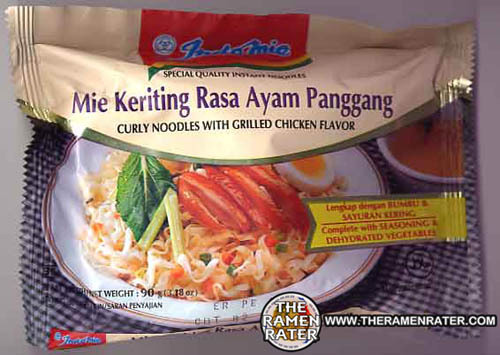 This stuff is really good – especially when you put two fried eggs on top of the ramen, then pour it over slowly. Fried shallots on top of that with a bit of shedded pickled ginger makes the scene complete. I can’t recommend any ramen more than this one. This is top! Get it here. This entry was posted in * Stars 4.1 - 5.0, Chicken, Indomie, Indonesia and tagged asian instant noodle soup, bowl noodle, buckwheat, chow mein, cooking, curly, fried, fried noodle, hans lienesch, indo, indofood, indomie, indonesia, instant noodles, instant ramen noodles, korean noodles, lienesch, mi goreng, noodle, Noodles, Ramen, ramen blog, ramen blogger, ramen rater, ramen recipe, ramen review, ramen reviewer, ramen reviewers, ramen reviews, ramen video, ramenrater, ramenrater.com, ramyeon, ramyun, rater, rating, ratings, review, reviews, saifun, saimin, seattle, soba, special, spicy, the ramen rater, the ramenrater, theramenrater, theramenrater.com, top ramen, udon, washington, wheat, wheat noodle, yakisoba on June 30, 2009 by Hans "The Ramen Rater" Lienesch.